When temperatures begin to drop, nothing beats cozying up inside. Create a lovely ambiance by making (and lighting) a candle. This Winter Gardenia Fragrance Oil candle fills the room with a unique floral scent. With notes of peppermint, gardenia, lily and jasmine, this scent is perfect for the holiday season and cold days. 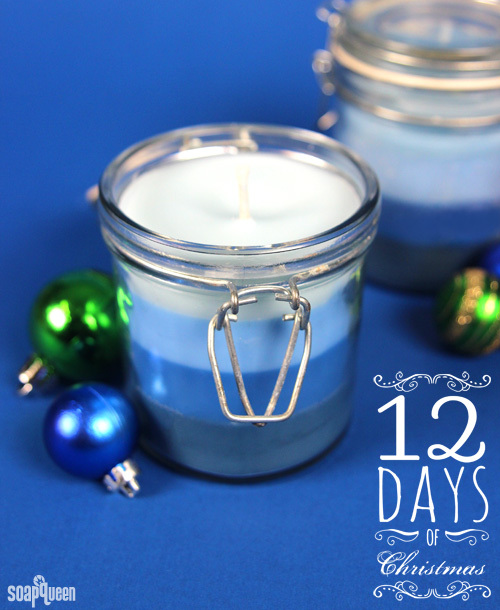 This candle features layered blue hues, which become lighter from bottom to top. Easy to make, this project does require a bit of patience as it is important to let each layer cool and harden before pouring the next. NOTE: The glass bail jars shown in this tutorial have been discontinued. The kit now includes the Tapered Neck Candle. You may consider adjusting the amounts of wax and fragrance accordingly. Click here to add everything you need for this project to your Bramble Berry shopping cart! ONE: In a heat safe container, melt 8 oz. 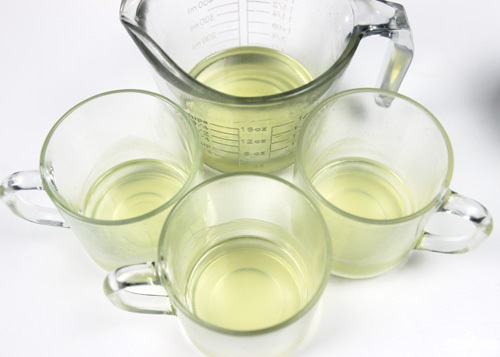 of EcoSoya Advanced Wax in the microwave in 30-second bursts or over a double boiler. Add .6 oz. of Winter Gardenia Fragrance Oil and stir to combine. 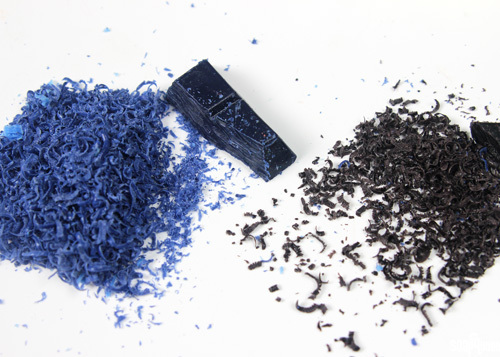 TWO: Using a cheese grater, grate the Black Wax Dye Block and Cobalt Blue Wax Dye Block. 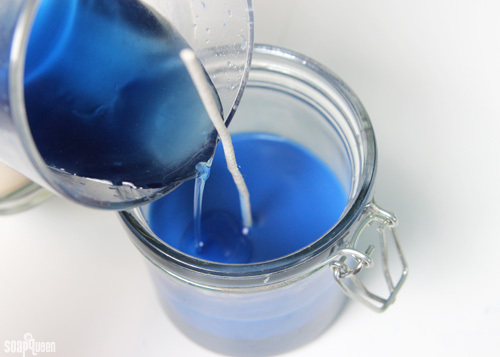 Doing so helps measure more accurate amounts of dye block into each layer of the candle. THREE: Split the wax into four containers. Each container should weight two ounces. 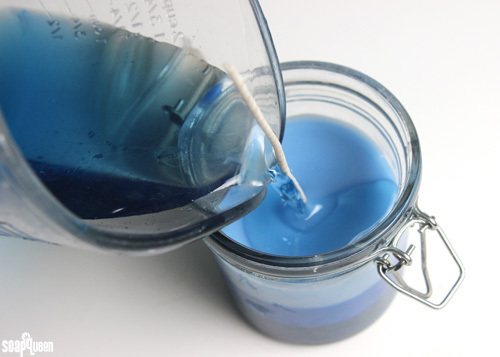 FOUR: To one container, add .5 tsp of black wax, and .5 tsp of blue wax. Stir until the colorants have melted and are completely incorporated. Cut through half of a straw and place the wick through it. The wick should touch the bottom of the candle. Pour the wax into the bail jar, and allow to fully cool and harden. FIVE: Reheat a 2 oz. container of wax in the microwave using 15 second bursts. Add .75 tsp. of blue wax and a small pinch of black wax. Stir until completely incorporated, and pour onto the cooled first layer. Allow to fully cool and harden. SIX: Reheat a 2 oz. container of wax in the microwave using 15 second bursts. Add .25 tsp. of blue wax and stir until fully incorporated. Pour over the hardened second layer, and allow to fully cool and harden. SEVEN: Reheat the last 2 oz. container of wax in the microwave using 15 second bursts. Add a small sprinkle of blue wax, and stir until fully incorporated. Pour over the hardened third layer, and allow to fully cool and harden. Trim the wick, and allow the candle to cure for 48 hours. This allows the fragrance to set up properly. Enjoy! 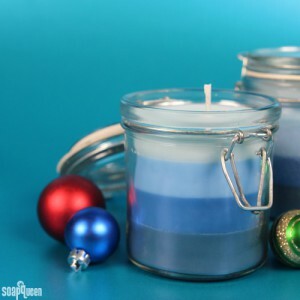 If you are looking for more information on candle making, check out these tips along with a summery layered candle tutorial. 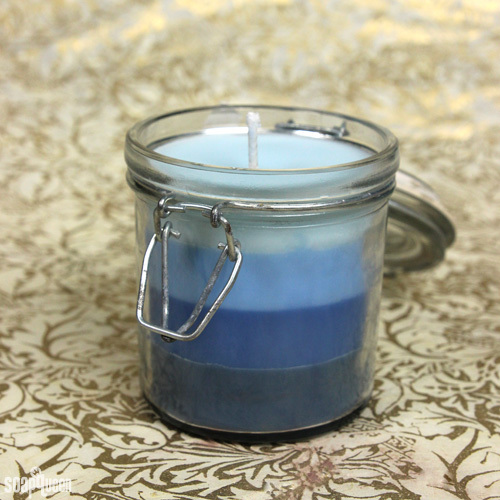 What is your favorite fragrance to use when making candles? This beautiful ombre candle fills the room with a gardenia scent. 8 oz. Glass Bail Jar NOTE: The glass bail jars shown in this tutorial have been discontinued. The kit now includes the Tapered Neck Candle. You may consider adjusting the amounts of wax and fragrance accordingly. In a heat safe container, melt 8 oz. of EcoSoya Advanced Wax in the microwave in 30-second bursts or over a double boiler. Add .6 oz. 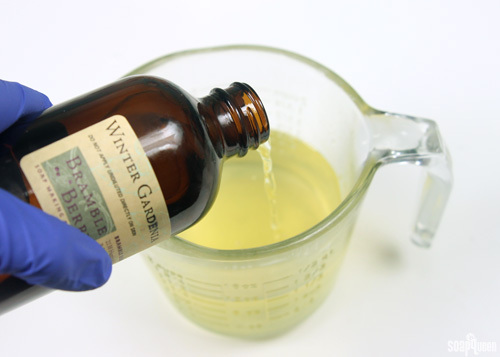 of Winter Gardenia Fragrance Oil and stir to combine. Using a cheese grater, grate the Black Wax Dye Block and Cobalt Blue Wax Dye Block. Doing so helps measure more accurate amounts of dye block into each layer of the candle. Split the wax into four containers. Each container should weight two ounces. 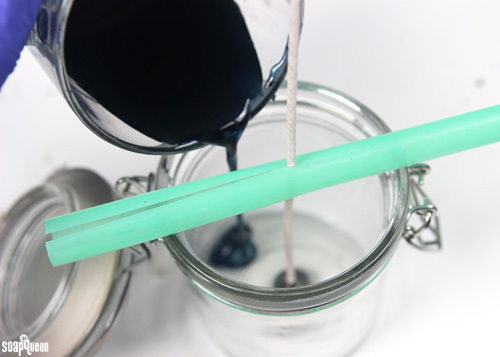 To one container, add .5 tsp of black wax, and .5 tsp of blue wax. Stir until the colorants have melted and are completely incorporated. Cut through half of a straw and place the wick through it. The wick should touch the bottom of the candle. Pour the wax into the bail jar, and allow to fully cool and harden. Reheat a 2 oz. container of wax in the microwave using 15 second bursts. Add .75 tsp. of blue wax and a small pinch of black wax. Stir until completely incorporated, and pour onto the cooled first layer. Allow to fully cool and harden. Reheat a 2 oz. container of wax in the microwave using 15 second bursts. Add .25 tsp. of blue wax and stir until fully incorporated. Pour over the hardened second layer, and allow to fully cool and harden. Reheat the last 2 oz. container of wax in the microwave using 15 second bursts. Add a small sprinkle of blue wax, and stir until fully incorporated. Pour over the hardened third layer, and allow to fully cool and harden. Trim the wick, and allow the candle to cure for 48 hours. This allows the fragrance to set up properly. Enjoy!